Updating your kitchen cabinets makes even an outdated kitchen more modern, stylish, and valuable. Though updating your cabinets is a minor kitchen remodels, it’s a quick renovation project that’ll net you the highest return on your investment: a study conducted by Remodeling Magazine found minor kitchen remodels recouped 92.9 percent of homeowners’ investments. In addition to adding value to your home, updating your kitchen cabinets helps you enjoy your home more. If your cabinets need a fresh new look, here are four new kitchen cabinet ideas you’ll love. Adding mesh inserts to your cabinet doors instead of glass updates your kitchen cabinets with a modern flair. Mesh can be used to achieve different looks by choosing different gauges, weaves, and patterns. Tightly-woven mesh offers only a glimpse of what’s inside the cabinets while also providing cover if your cabinets tend to be messy. Mesh that’s woven more loosely allows you to see inside your cabinets to quickly retrieve what you’re looking for. For a more balanced look, you might try using mesh inserts judiciously, interspersing them with open and glass-fronted shelves. If you have a modern kitchen, adding stainless steel cabinets or cupboards with a metallic finish can suit your design scheme perfectly. Stainless steel cabinets have long been found in restaurant kitchens and are now becoming popular in homes. Stainless steel cabinets are very sturdy and durable. Stainless steel is also easy to clean and is sanitary, which is desirable for cooking areas. Finally, stainless steel cabinets are a green choice: they’re recyclable and can be cleaned without using harsh chemicals. 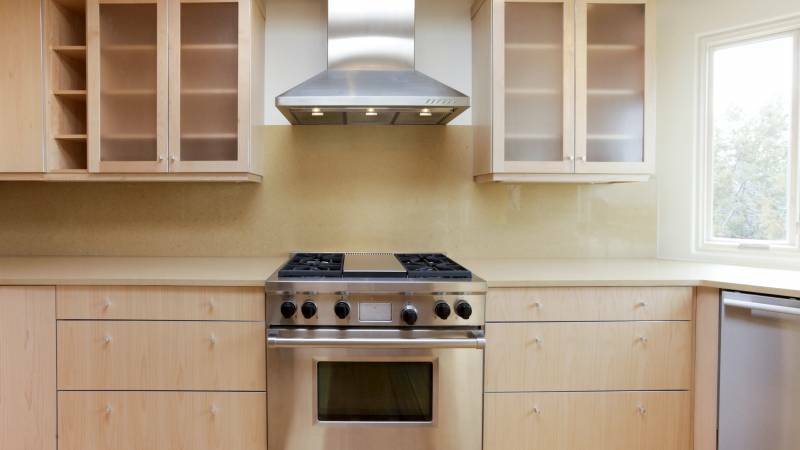 Do keep in mind that stainless steel is a more expensive material than wood. One option you have if you’re looking to cut costs is to use wood cabinets with metal drawer fronts and doors. This allows you to achieve the look of stainless steel cabinetry in your kitchen at a lower cost. Display-style minimal glass-fronted cabinets are making a comeback in today’s kitchens. These cabinet fronts use glass windows to display your dishes as if they’re contained in the curio cabinets of the past. However, these cabinets don’t look old-fashioned. Minimal glass-fronted cabinets give your kitchen the beauty of having open shelves without having to deal with dust and grime. They lend your kitchen a more open, welcoming feel while allowing you to protect your favorite dishes. These minimal glass-fronted cabinets are available in many different styles and can be at home in more modern kitchens as well as those with classic designs. If you don’t want to have glass fronts on all of your cabinets, adding one row of them can add style to your kitchen. Another idea might be to choose minimal glass-fronted cabinets for your upper cabinets while keeping your lower cabinets intact. While white kitchen cabinets have long been popular, dark or modern wooden cabinets can offer a feeling of luxury. It’s important to choose the right hue for your dark wooden cabinets and to incorporate lighter colors around them unless you want a Gothic look. It’s also important to keep in mind that using too much dark wood in your kitchen may make it feel smaller, so it may not be a good idea if your kitchen is already cramped. However, using dark or modern wooden cabinets in larger kitchens can lend a sense of calm ambiance to the room. Updating your kitchen cabinets can help make the entire room look much better and more appealing, even if you aren’t completing a total renovation to upgrade every feature. You can make smaller updates, like changing out the doors on your existing cabinets, or make larger changes by choosing new cabinets altogether. Before you settle on a cabinet style, make sure you take the time to research different cabinet and cupboard ideas to find more inspiration for your own kitchen. An online search will reveal the countless choices you have when it comes to upgrading your cabinets. From classic to modern, cutting edge to casual, a new set of cabinets adds value in any style.